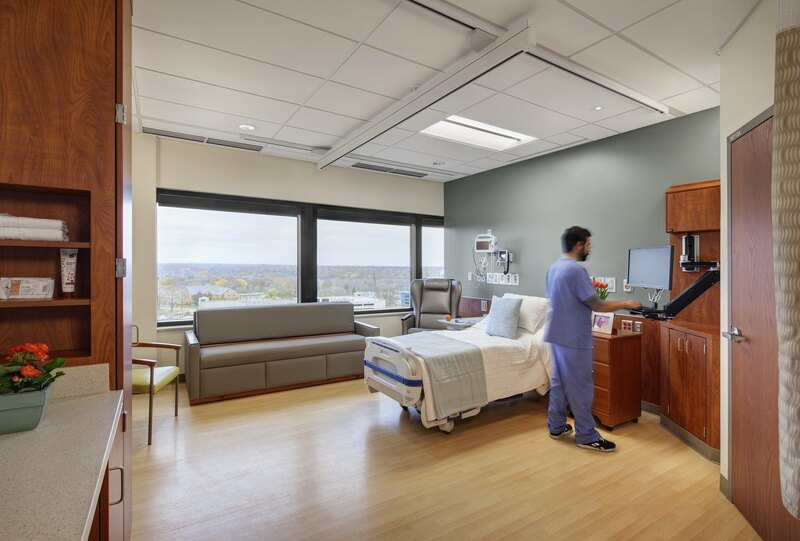 HGA Architects and Engineers and Froedtert & The Medical College of Wisconsin have won a Silver Level Evidence-Based Design (EBD) Touchstone Award for their research-based planning approach of a new medical-surgical unit at Froedtert Hospital in Milwaukee. Presented by the Center for Health Design, the inaugural EBD Touchstone Award recognizes outstanding achievement across three touchstones of EBD process: Collaboration, Evaluation, and Sharing. The award submission detailed pre- and post-occupancy research methods used to plan the medical-surgical unit at Froedtert, in which the design team combined Dr. John Kotter’s eight-step change-management theory with EBD tools and Lean strategies to transition from a centralized to decentralized nursing unit to improve workflow and patient care. The research findings previously were featured in “Taking the Right Steps: The Role of Design Research in Change Management of a Redesign Project” in Healthcare Design in October 2016, “Making the Case for Practice-Based Research and the Imperative Role of Design Practitioners” in HERD Journal in November 2016, and “Lean + Evidence-Based Design + Change Management: Merging Approaches for an Inpatient Build-Out Design Project” at the 8th Annual National Nursing Research Symposium in June 2017. The HGA project team included Kurt Spiering, FAIA, Principal; Kara Freihoefer, PhD, CID, EDAC, LEED ID+C, Senior Researcher; Kiki Werkheiser, EDAC, CLSSGB, Work Process Specialist; Lori Magalen, Medical Planner; and Brent Peterson, PE, Lean Workflow Engineer. The Evidence-Based Design Touchstone Award was presented at the annual Healthcare Design Expo & Conference, where HGA presented six sessions November 11 – 14.